This post has already been read 6190 times! VMworld is less than a week away. I’m very very excited to fly into Las Vegas next Sunday. My Last time at VMworld US was in 2012… How time can fly! VMworld is a five-day conference that will take place at Mandalay Bay in Las Vegas August 26 – 30. Go check vmworld.com for more information. So, Why am I going to VMworld in the US this year? I have been a bit out of tech for some time now, so it’s time for me to update on everything VMware. especially HCI, multi-cloud and NSX. To connect to my VMware community friends and vendors. Speak to them on the floor and the vendor party’s to catch up with them, share idea’s and have a good time/beer. Got invited for Tech Field Day Extra and attending 2 afternoons..
Tweet live about vSphere What’s New during the keynotes. and release some posts during the events. Write about cool stuff I’ve seen during the show. attend a few sessions during the show. vSphere Clustering Deep Dive, Part 1: vSphere HA and DRS[VIN1249BU] Duncan and Frank. Pioneers of the Possible [GSUTUES] Sanjay Poonen is always a yes. VMware CTO Panel: What’s Over the Horizon? [CTO3496PU] Chris Wolf, Shawn Bass and more. Go find the vBrownbag guys in the community hang space at VMworld. And sit down and listen to another peer presenting! maybe next year it will be you! The Tech Field Day events bring together innovative IT product vendors and independent thought leaders to share information and opinions in a presentation and discussion format. Sunday – 20:00 – 23:00 VMunderground 2018. Beerhaus 3784 S Las Vegas Blvd. I will be at the door helping out my friends from vDB. Monday – 19:00 – 22:00 Zerto ready to Rock Party. House of Blues Mandalay Bay 3950 S Las Vegas Blvd. Monday – 21:00 – 23:00 Rubriks 2018 VMworld Party. Hakkasan Las Vegas Nightclub 3799. Looks like RUN-DMC and The Roots will be performing so I will def. take a look here. Tuesday – 19:00 – 23:00 Veeam’s Legendary VMworld Party. Omnia Nightclub 3570 South Las Vegas Boulevard. Wednesday – 19:00 22:30 – VMworld Fest. World Market Pavilion 205 W Symphony Park Ave. Bring your full conference Pass. I have to thank KEMP Technologies and VMware to make this trip possible. 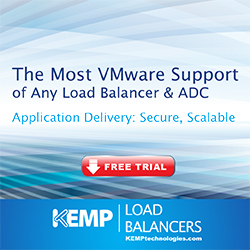 KEMP is sponsering my travel expenses and VMware has sponsored me a blogger pass to attend the VMWorld event in Las Vegas.